Have a scope around 13lbs dressed, but hoping to get a larger scope in the future, will keep the smaller scope for grab and go, getting one mount would save money, would the DM6 be overkill or just set the tension lower for the smaller scope? Any thoughts? My 107mm is about that weight and rides perfecly on the DM6. I don't consider it over-mounted at all - the mount does not look disproportionately large, and I like the perfect stability and resistance to vibrations. Get the DM6. I have mine on an Avalon T-Pod 110 with 8" extension. It's a great setup for my EdgeHD 8", Omni XLT 6" achro, SW120ED or NP101is. The motion is smooth, vibration-free and you can adjust the altitude tension so the OTA does not dip down when switching eyepieces. Edited by Sarkikos, 09 November 2018 - 08:18 AM. DM6. You absolutely won't regret it and you won't be asking yourself "why didn't I get it" later when you increase OTA size. I use a 8" f6 refractor with binoviewers and power slide and 3.5" feathertouch focuser on this mount. It's a rock. The DM6 also handles balance changes better than the DM4. This is helpful when changing eyepieces or using heavier eyepieces. It does a great job with our TEC 140. I have a DM-6 head fitted on a Berlebach altazimuth mount and I have never regretted for one solitary moment purchasing it. But I do have a William Optics 158 mm F/7 apochromatic refractor attached to it. As others have pointed out it is expensive. But it is worth it in the long run. In 10 years time you will most certainly have great admiration for the DM-6, Bob G.
Good steady viewing to you from Aubrey. The DM6 is light for its capacity. I can carry it and the tripod (Berlebach Planet) with zero problem. Granted I am somewhat of a beast but my wife, who is 120 lbs and 5'3" tall and no where near strong, can also carry it out too. Go with the DM6. It holds my 6" Tak APO, Mewlon 250, and held my EdgeHD 11" with no problem. I have seen it with a TEC 180 as well. Better to overmount than undermount. Also Astro Devices has the Nexus DSC encoder kit for it. The encoders from Astro Devices are a much higher resolution than what you get from DiscMounts. And the Nexus is a really nice addition to the mount. I've loved my DM6 with my old Tak Toa130, my Lunt double stack 60mm, and my AP 130Gtx. I'm using Tom's Ash wood tripod and find it no problem to schlep the tripod, the extender column, and the DM6 itself as one unit/trip, and then the OTA on a second trip. All together Is too much. given you state you want a bigger scope in the future, or, at least the possibility, bigger in this case is better... Plus the price differential is not proportionate, making the bigger 6 a relative bargain in my opinion. For or the next year, it's now going to be my only mount, as my MI250 is in storage whilst we rent for at least a year here in the Texas hill country. But the much darker skies are nice compensation (SQM of almost 21). I got the Sky Commander with 4000 DSC option on my DM6). Had it for 8 years now with NO issues. Truly, I am impressed that some of you consider a DM-6 on a Planet or any other tripod befitting a DM-6, an easy to wrestle out the door rig. My DM-6 sits on an AP-Baader wood tripod with a pier extension and it is a substantial load - and I wouldn’t even dream of trying to lift with a scope like my 140EDF attached. The DM-4 is also a wonderful mount. Both the DM-4 and DM-6 are well suited to their respective jobs. The simplest answer, therefore, is to get both! The DM6 is quite a deal larger and heavier than the DM4. Do you want a setup you can carry out the door fully assembled, scope and all, ready to go? That's how I use my TeleVue scopes on my DM4 and that is a sweet setup. Quick, light and easy to get observing. I can't get my DM6 plus scope outside in one trip. If that doesn't concern you, and you only want one of these mounts, then the DM6 seems logical from a future proof point of view. What helped me a lot was fitting wheels to my Losmandy FHD/DM6 setup. I can leave the scope on the mount and wheel the whole thing away. Then bring it out anytime I want and be up and observing in a couple of minutes. and this, despite an increase in beer consumption. I even carried my wife across the house the other day which she hated. Unloading and moving the 86# mini fridge yesterday was also easy. So, my "easy schlep" on DM6, pier extender and ash tripod might not be another's. I WAS able to move the entire setup with the AP on it, but it was unwieldy and scary. So I don't and won't repeat that. I am guessing that the setup, sans scope is around 55 pounds maybe? But lots of convenient "handles". If 13 lbs fully dressed was as big as you were ever going to go, DM4 would be good, but with you expressed interest in a larger scope DM6 is the way to go. I also have DM6 on a Planet but that represents 2 trips for me ! DM6 - for all the reasons above. Don't let the weight scare you off. You'll be making multiple trips to the backyard or car or however you will be using the gear anyway....guaranteed. Haha, if I had to carry all of that outside every time I wanted to observe, I'd be spending most of my time indoors typing out replies on CN instead! I am certainly not knocking the DM-6, I own one - in fact I'm on my second. However, I personally don't feel it is the one size fits all answer that many of you suggest - whether you ascribe to a "grab and go" concept or not. 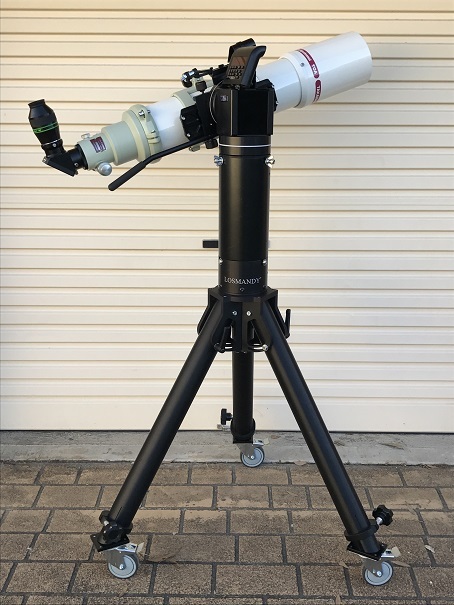 The simple fact remains that for me, I don't hesitate to observe around the house expressly because I am able to set-up a DM-4, tripod and 3-4" refractor quickly. I dedicate my DM-4 to these scopes and the DM-6 dialed in for my 140. If I was using a DM-6 for both - aside from not wanting to wrestle with it each night - I'd also have to spend the time readjusting the tension to suit one scope or the other. Perhaps not a big deal to some but it is a factor for me. If I had only a 5-6" refractor then I would no question go with just a DM-6, but I also was quick to pick up a used DM-4 when one came up for a good price specifically because I have 3-4" scopes as well. A succession of other Alt/Az mounts over the years did nothing to keep me from going back to the Discmounts although I still maintain a Giro Ercole for double mounting pretty much anything I currently own scope-wise. All that said, if the choice had to be just one mount for both a 13lb pound and an aspirational heavier scope some time in future then yeah, I'd probably go with the DM-6 (but would be looking to add a DM-4). Edited by Doug D., 13 November 2018 - 10:01 AM. I agree both is the sweet spot. Sometimes the DM6 is a bit heavy. I use my DM4 on a Bogen Tripod typically with my Tak FC100DF. This is a real nice grab and go, I actually am thinking of cleaning up my Vixen VC200L and putting it on the DM4. Oh and I use a Nexus DSC on both.